Section 117 – Page 21 – Then you will know the truth, and the truth will set you free. Vietnam is perhaps the most misunderstood war of the 20th century. The popular perception of the conflict is that America waged an aggressive and futile war to prevent the spread of Communism in South Vietnam, even though South Vietnam’s people welcomed it anyway. The Americans are seen as war criminals that bombed the country to rubble and committed countless atrocities, while the Vietcong and North Vietnamese Army were fighting to liberate their brethren in the South. The impression is left of an arrogant superpower that tried to triumph over the will of a local people and was defeated by overconfidence and shortsightedness. The reality of the war is much different. The Americans fought a defensive war to help South Vietnam resist annexation by the Communist North. Their plans were not to roll back Communism in North Vietnam or change its regime, but rather were to aid an ally against an invasion and subversion. As for the people of South Vietnam, the vast majority had no wish to live under Communism. North and South Vietnam during this period were very different. The North was rural and agrarian, while the South was more urban and capitalistic. This is one of the reasons that during the Viet Minh war against the French there was little sympathy for the Communists in the South. Most of the Vietminh and major fighting during the French-Indochina war was in the North, while the South was mostly dormant. This is why Vietnam was split into two countries after the conflict ended; resulting in a pro-U.S. state in the South, and a Communist state in the North. A few statistics illuminate how much the South Vietnamese desired Communism. After the French-Indochina war, as many as 1,000,000 Vietnamese fled the North while perhaps a tenth of that number fled in the other direction. Also during the latter part of the Vietnam War, as many as 200,000 Vietcong and North Vietnamese Army personnel deserted to the supposedly corrupt, and wicked, government in Saigon. Even more staggering is the estimated 2,000,000 who fled South Vietnam after the end of the war. It is telling that when the NVA conquered South Vietnam, its top generals estimated that at best one third of the people supported them. The idea that it was a mistake to support the South Vietnamese government and prevent the spread of Communism is likewise false. While there is no denying that the regime in Saigon was militaristic and undemocratic, the same was true about South Korea during the Korean War, and Taiwan during the Cold War. However, unlike South Vietnam, South Korea and Taiwan were allowed to stabilize, build up market economies, and eventually develop healthy democracies. Who can say without reservation that a stabilized South Vietnam free of Communism would have been worse than under the thumb of Bolshevism? The Vietnam War was simply another part of the struggle against Communism during the Cold War. With hindsight, the Soviet Union and her allies may seem ridiculous, but at the time they were anything but. In order to understand the American decision to make a stand in Vietnam, it is necessary to look at the context of the time. During the early ‘50s, when the decision was made, the Cold War was not looking good for the West. The Soviets had gotten the bomb, China and Czechoslovakia had fallen to Communism, and there were Communist-inspired insurgencies being waged across the globe. Add to this the decline of the Western European powers, and the general hostility of the emerging third world towards the West, and it is easy to see how Washington felt it needed to fight back against the Reds. The Americans had to fight in Vietnam to show they would support their allies against Communism. 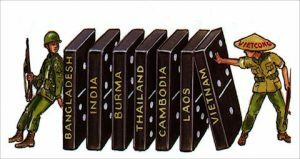 Despite what the pundits say, the domino theory was not mere rhetoric. With the exception of Cuba and Chile, all the countries that fell to Communism bordered on other Communist countries and received help from them to facilitate it. Russia had helped Mao take over China, and then Mao had helped Ho Chi Minh take North Vietnam, just as North Vietnam eventually conquered the South. It should also be remembered that after the Vietnam War ended, Laos and Cambodia, both of which border Vietnam, fell to Communism as well. Additionally, during the 30 years of the Vietnam conflict, there were communist insurgencies in Malaysia, Thailand, Indonesia, and the Philippines. These were defeated by a combination of good counter-insurgency techniques, and with the exception of Thailand, the absence of bordering Communist countries to give the insurgents support. It is also a myth that the American conduct during the Vietnam War was exceeding brutal and immoral. Most of the charges are in regard to the bombing of Vietnam, the Phoenix program, and atrocities like the My Lai massacre. The bombing campaign against Vietnam was actually much more discriminating than the strategic bombing campaigns against Germany and Japan during the Second World War, and against North Korea during the Korean War. While undoubtedly many innocent Vietnamese lost their lives from American bombs, during the Vietnam War there was nothing remotely similar to the systematic destruction and firebombing of German and Japanese cities, or the use of Napalm against North Korean cities that killed hundreds of thousands. The bombing was so discriminate that Secretary of Defence Robert McNamara often micromanaged it to prevent civilian casualties. That the bombing of Vietnam provoked more outrage than that of World War 2, or Korea, is likely the result of the massive media coverage that was not around during previous conflicts. The brutality of the Phoenix program is also an exaggeration. This was a campaign run by the C.I.A. and South Vietnamese to identify and neutralize civilian cadres supporting the Viet Cong and NVA. In popular perception it is seen as an assassination campaign that killed thousands of innocent Vietnamese. In reality it was necessary to provide at least three pieces of proof to identify a communist supporter, and the vast majority of those identified were imprisoned, not killed. While there is no question abuses were committed, there is nothing to suggest that there were systematic flaws in the process. This is not to suggest that the Phoenix program is not above moral scrutiny, only that it was far less destructive than is usually assumed. The perception that American forces committed widespread atrocities is a myth. With the exception of the shameful My Lai massacre, there does not seem to be a pattern of significant war crimes committed by American forces. Given the integration of so many anti-war journalists in the conflict, and given that no evidence has surfaced (including among the Pentagon Papers) of similar atrocities since the end of the war, it is unlikely that the My Lai massacre was a typical event. Without sufficient evidence, it is simply not reasonable to suggest the Americans committed widespread atrocities. However, what has been well documented and established are the brutal atrocities committed by the Communists in Vietnam. During the conflict they assassinated 35,000 and kidnapped 60,000 South Vietnamese. These were mostly civilians, including mayors, judges, teachers, social workers, and doctors. These assassinations and kidnappings were typical insurgent tactics to scare the populace into supporting them as well as to undermine the control of the government in Saigon. Another typical atrocity was when the Communists murdered 3000 – 5000 South Vietnamese civilians in Hue during the Tet offensive. Even more appalling were the massacres committed by the Khmer Rouge in neighbouring Cambodia after the war that killed perhaps 2,000,000 of their own people. Another misconception of the war is that the Americans failed miserably at counter-insurgency. 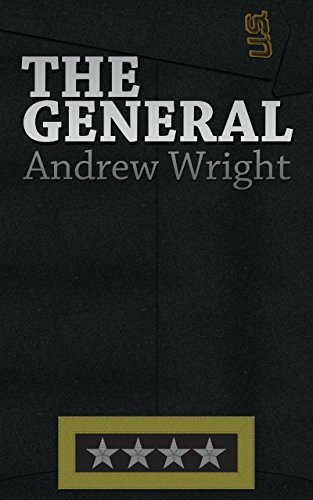 It is true that under General Westmoreland the American army focused too much on relatively ineffective search and destroy missions. However, after the Tet Offensive the Americans improved their methods to defeat the guerrillas. While ambitious projects like the strategic hamlets, and methods used to neutralize the Ho Chi Minh trail, produced ambiguous assaults, other methods, such as arming the local populace, hearts and minds missions, the Phoenix program, and the re-distribution of land, ultimately neutralized, if not outright destroyed, the Communist insurgency. In fact, South Vietnam fell, not to insurgents, but to a massive invasion by the North Vietnamese Army after the Americans withdrew and left South Vietnam to its fate. The South Vietnamese, contrary to popular perception, did fight back stubbornly but were ultimately defeated by a better-equipped army. It should be noted that whereas the Americans gave the South Vietnamese next to nothing in weapons and supplies after they left, the Soviets gave the North billions of dollars worth. Therefore, I humbly suggest that Vietnam was a just war. The Americans were fighting a defensive war to protect a country and people who had no wish to be conquered by Communism. The Americans had to fight in Vietnam to reassure their allies and contain Communist expansion. American conduct was generally more moral than that of the North Vietnamese, and their counter-insurgency campaign was successful. Unfortunately, the Americans failed to support South Vietnam after they left and the country was conquered by the North Vietnamese Army backed by considerable Soviet aid. However, the final myth of the Vietnam War is that the Communists won it. While they finally conquered South Vietnam after thirty years, the conflict did much to strain relations inside the Communist world. This eventually led to armed conflict among the participants. During the Vietnam War itself, the Soviets and Chinese fought skirmishes along their shared border. Even more disastrous were the Vietnamese conquest of Khmer Rouge Cambodia, and the Chinese Invasion of Vietnam in the late ‘70s. For the Communist world, Vietnam was a pyrrhic victory. We’ve heard it all before. All the problems in the Middle East are the faults of the West, the United States, and Israel. Western countries like Britain and France carved up the Middle East after the First World War and milked them for their resources. The United States sponsored coups against legitimate governments and supported wicked regimes to fight the Godless Communists (not to mention the Iraq War). And Israel deserves special censure for its deplorable treatment of the Palestinians, and its countless wars against her neighbours. Unquestionably much of this is true. There is little doubt that the Western world and Israel have a lot to answer for their conduct towards the Middle East. But is it really the case that all the troubles of the Middle East can be conveniently blamed on outside influence? To suggest that the nations of the Middle East, with their incredible oil wealth, and considerable military power, have been consistently wronged and victimized is absurd. Since the late 40s, and for some of them even earlier, the nations of the Middle East have been sovereign countries. Now of course there have been coups, and at least in Iraq, an overthrow of a sovereign country by a western occupying force, but overall the nations in the region have enjoyed freedom to do whatever they want. And what have these countries done for the last sixty years? Have they built legitimate democracies? No. Have they in general emancipated women or oppressed minorities? No. Have they created welfare states? No. Have they built modern, and diverse economies? No. Have they built huge standing armies to fight Israel and each other? Yes. Have they constructed massive security organizations to control their populaces? Yes. Have they built palaces and other absurd luxuries for their elites while their own people have starved? Yes. None of this is to suggest that all the nations in the region are inherently wicked, corrupt, or inefficient. Some of the countries like Turkey, and the Gulf States are relatively progressive, and most are generally peaceful. And to be fair many of the problems infecting the region can be seen in Asia, Africa, and South America as well. However the point remains that after sixty years of independence instead of spending oil money on building prosperous societies, the nations of the Middle East have squandered their resources on enriching decadent elites and futile wars against Israel, and each other. While the western media seems hell-bent on showing how many Muslims have been killed by Coalition troops in Iraq, or Israelis in the occupied territories, it has conveniently missed the fact that during the last sixty years Muslims have killed more Muslims than the West or the Israeli have. 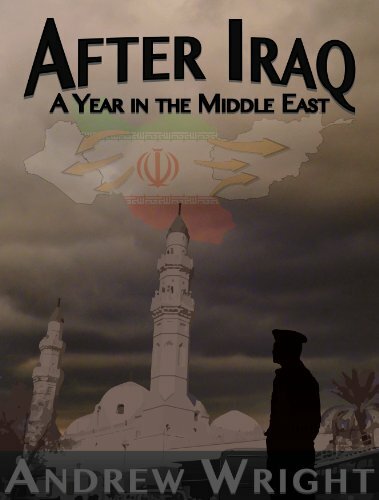 The worse war in the region by far, “The Iran-Iraq War” of 1980-88, saw more Muslims deaths then all the Arab-Israeli wars combined several times over. To this we can add the Yemen, Lebanon, and Jordanian Civil Wars, Afghanistan after the Russian withdrawal, the sad conflict in Darfur, the barely known Egyptian-Libyan conflict, the Iraqi invasion of Kuwait, and technically even the Iraq war itself. One could argue that the Iraqis and foreign insurgents have seemed more intent on killing each other than the Americans, if you factor in all the deaths from sectarian violence, terrorism, and criminals. This does not even include the treatment of the Palestinians. While the countries of the region always go on, and on, and on, about the Israeli atrocities against the Palestinians, history shows that the Arabs have treated them worse. In the 1948-49 war when Israel was created Egypt and Jordan occupied the Gaza Strip, and West Bank, respectively. Incidentally these areas had a majority of Palestinian inhabitants and were supposed to form most of what was to be the Palestinian nation as deemed by the U.N. Did the Egyptians and Jordanians hand over power to the Palestinians and help them make stable and prosperous countries. No. Did they annex the territories and use them as springboards for terrorism against Israel. Yes. It should be remembered that whereas the countries in the region have spent much money funding Palestinian terror they have done little to alleviate the poor living conditions of the Palestinians themselves. After the 6 Day war the Israelis conquered the Gaza Strip, and the West bank, and Egypt and Jordan washed their hands of responsibility. To this day the occupation and pillaging of the territories by Arab armies is barely mentioned in western media. As for a body count, it is probable that Jordan, Syria, and Lebanon, each country by themselves have all killed more Palestinians than the Israelis. Jordan killed more Palestinians during the Civil War in the 70s than the Israelis did during the intifadas. Syria killed countless Palestinians in refugee camps and during their occupation of Lebanon. And during the Lebanese civil war the Christian Phalangists butchered the Palestinians on many occasions, including the infamous slaughter at the Sabra and Shatila refugee camps during the Israeli invasion of Lebanon. Finally we should not forget about the Kurds. The barbaric counter-insurgency methods used the countries in the region to counter Kurdish independence movements make Israeli actions in the territories appear mild. The poison gas attack against the Kurdish town of Halabja by Saddam Hussein is perhaps the most vivid example. It is disgusting, and beyond hypocrisy that the people and rulers of the region can be so indignant about Western and Israeli actions when they themselves have killed more Muslims, and more Palestinians, than they have. It is even more disgusting that the majority of people in the Western world do not even know these simple facts; being content on assuming the United States and Israel are to blame for everything. That the people of the Middle East believe these lies is more forgiving; their media is under state control and they have been raised to hate Israel and the west. That the people of the Western world believe these lies despite having democracy and open media… well, that is deplorable. A final point concerns how the people in the region feel they are portrayed in the media. Now it goes without saying that there are no lack of intolerant, or frankly just ignorant people in the west who do not know the first thing about Islam, Arab or Muslim values. It is certainly not an exaggeration for Muslims and Arabs to suggest they are often victims of discrimination. However, on the other hand the way the West, and especially Jewish people are depicted in Arab media is less than flattering to say the least. Everyone should remember about that stupid cartoon made in Denmark that criticized the Prophet of Mohammed. In the aftermath of that idiotic publication the Arab Street went berserk and attacked embassies and threatened violence against the West. All of Western society was deemed culpable for a single cartoon drawn by some twit in Copenhagen! While it seemingly unacceptable for the West to draw cartoons offensive to Islam, it is apparently o.k. for the Arab media to draw racist caricature of Jewish people with stereotypically hooked noses, as well as blatantly spreading hatred against Israel and the West. It is not unreasonable to suggest that such media had its origins in the Third Reich. None of this is to condone bad policies set by the West or Israel. On the contrary they should own up and be held accountable for their actions. It is fair to say that in general Western and Israeli influence on the Middle East has been negative. However, the same must be said about the nations in the Middle East. Only by owning up and learning from their mistakes can they put behind all the hate and rage that has done nothing but ill for their peoples.